Emancipation Oak is a historic Live Oak (Quercus virgiana) tree located on the campus of Hampton University. It was the site of the first Southern reading of President Lincoln's Emancipation Proclamation in 1863. The large sprawling oak is 98 feet in diameter. It is designated one of the 10 Great Trees of the World by the National Geographic Society. 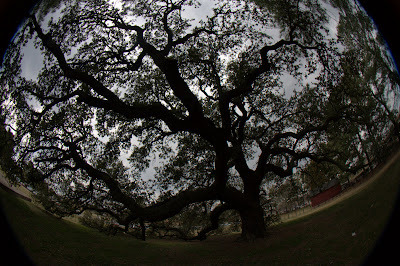 This photo was taken under its spreading branches looking upward with an 8mm fisheye lens. Canon 40D, f/8.0, 1/320s, ISO 200, Sigma 8mm f/3.5 circular fisheye.